I don’t feel comfortable when reading “ranting” posts. I would much rather focus on the positive than on the negative. And if bothered by something, I think acting –doing something– tends to be more constructive than complaining. So please bear with me –and forgive me– for what I am now about to do. Believe me, it goes beyond simply letting off steam. Soon after I started my first website I was invited to participate in a small online group of international quilters. What a blessing! My induction into the online quilting world was such a positive experience, and I was to benefit from friendships with other women all around the world. We shared each others’ stories, we played games, we swapped blocks, we carried each other in difficult times, and celebrated small and large successes together. That was twelve years ago, and I will always credit this group as the place where I was taught the spirit of quilting. Since then I have had several different quilting websites, have moved into the professional side of quilting, have made even more friends and –quite, quite unfortunately– have also lived through some (shockingly and quite unexpectedly) negative experiences. That doesn’t mean I have gotten used to discrimination and what sometimes feels like insensitivity. Does one ever? If you have followed my interviews with several international quilters, you will be aware that many of us who have taken up this activity in other countries do so in isolation and facing many challenges. If and when we find fabric, it is in small quantities and with little variety. Tools and other supplies are practically non-existent. My personal take on this is that it is a blessing in disguise, as it challenges us to be even more creative. And for so many of us, the online quilting community has been the only place where we are able to meet with other quilters. 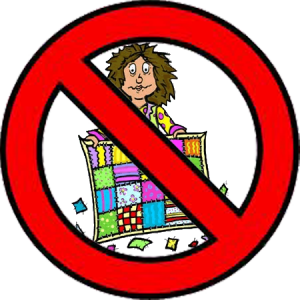 Over the past couple of years I have witnessed what would seem to be an explosion of quilting blogs. That’s exciting. It breaks down borders even more, and brings us closer together. And it seems that particularly over the last year or so the use of giveaways has been a way to attract more and more visitors to individual blogs. (I’m starting to feel giveaways are extremely overused… but that’s a subject for another day.) 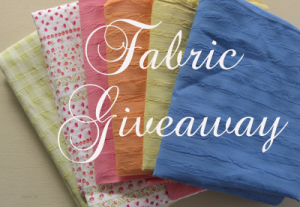 What many quilting bloggers may not be aware of, however, is that with very rare exceptions these giveaways tend to isolate already lonely quilters in other parts of the world. The reason given for limiting these giveaways to U.S. residents –quite understandably– has to do with postage. Believe me… those of us who live outside the United States are very well aware of the high mailing costs. If you think it is costly to send packages from the U.S. to other countries, it is even costlier the other way around. Ask me how I know this. And yet… it is often not about the $$$, but about participating in and building a community. The quilting community is known for its generosity. And I am not here to berate other quilters, but to simply share how they may unwittingly be hurting the feelings of fellow quilters in other countries. And to ask that they consider –only every now and then– to open up and include other countries in their giveaways. Maybe instead of two different giveaways, consider doing only one and giving a wider audience a chance. I do see that there are many giveaways open to Canadian visitors. That’s wonderful. It does cost a little more to mail packages to Canada, but I guess it’s within reasonable limits. And so I would say that if opening giveaways to other countries is simply unaffordable, at the very least consider opening them up to Canada and Mexico. Mexico is part of the North American Free Trade Agreement (NAFTA). What this means in terms of postage… is that it costs just a few cents more to mail a package to Mexico as compared to Canada. Enough. I’m getting off my soapbox now. But this is not a monologue. I much prefer an open dialogue. What am I overlooking? What is your experience? How do you feel about this issue? What can you add or expand upon? I’m not the only one wanting to know… let’s all build some understanding together! I have limited my shipping to other countries not because I wanted to, but because I am disabled and cannot get to the post office to mail out of country packages. There is more paperwork to do, and to get fair shipping to my customers, I need to take it there. The internet I have found does not offer the lowest price I can get for that person. I used to mail to Canada all the time, but after finding out I have a terminal cancer that has caused tons of bones to break in my body, I was unable to drive anywhere, walk very far, and a number of other things. So in fairness to some of us, the reason we might limit these shippings, is because we can’t, not because we don’t want to. But there are the ones out there, that are probably just too lazy to deal with it!!! Thank you so much for pointing this out, Tricia! It helps understand a completely valid reason for not being able to ship out of the U.S. What is more, kudos for you for not letting a disability keep you from doing what you want/need to do! This reminds me of what they do in US schools now. Everyone must get a ribbon so no one’s feelings get hurt. How is that fair to the ones that really win? I have to say that give aways in general annoy me – the ones where someone is genuinely giving something away for the pleasure of sharing with others are very affirming. Those make me feel that human beings _can_ be kind to one another. Sadly, many give aways are what I think of as commercially – based — items that are really meant to advertise the giver/company, whatever. Those … seem less pleasant to me, but the recipient probably does’t care about the motif behind the give away. 🙂 I think those are often restricted to the North American continent because that is the perceived area of the commercial entity’s interest. To me, that outlook is pretty short-sighted, too. The only legitimate reason for restricting give aways, to me, would be the whole postage/shipping issue. Anything else is really off-putting to me! There is also growing group of bloggers that host giveaways, which are open to anyone in any part of the world, but the recipient is required to pay postage. I’d be curious as to what you think on this approach. I think that’s an interesting concept, Darlene. I guess what I’m advocating for is “equal opportunity.” So if those are the rules of the giveaway for all participants, regardless of the country, then it probably is a good alternative. I myself did something similar a while back. I had extra copies of my book that I just couldn’t give away locally, but the postage anywhere outside my country cost more than the book itself. I proposed that whoever won the giveaway split the mailing costs with me, and was happy to see so many people willing to do so. I love win-win situations! I do think Ann Marie’s comment is interesting also. I guess it shows we should do our homework. Because this applies to commercial businesses, too. I am more than happy to pay for postage to my country, but there are very few businesses offering that as a possibility. They’ll ship to neighboring countries, but not to Ecuador, and I’m still mystified as to the reasons. I work for the us postal service and I can tell you if you mail 3 identical packages out one across the US, one to canada and one to mexico. The one staying in the US will cost the most if it is just a small package with a few FQ in it. Because we are only getting it to the borders of canada and mexico. The rest of the world isn’t too bad as long as you keep the packages under 4 pounds. the lighter the package the cheaper it is too send. I live in the US and it still annoys me too, so I can imagine how it makes the rest of the world feel. I avoid blog posts which mention give aways … and if that is about all the blog is about on a regular basis I delete them from my reading list. Apart from anything else, they make for boring reading! On my own blog I do have ‘give aways’ … when I have time or some reason to celebrate I offer EQ project files and/or pdf format to anyone who asks. If I start getting too many requests I might have to limit the number to a number I think I have time to respond to. Being virtual in nature, it doesn’t cost me anything more than time to create the product I am giving away and more time to respond. I could give away virtual products without the personal response, but I enjoy the personal touch … I blog to make contact with quilters, and this is one way to do it. There are occasional giveaways on my blog and the only time I limit them to U. S. winners only are the times when I’m out of town for an extended period and my husband will be mailing the package from his office. He will not spend the time standing in line at the post office. Also, we’re moving to a very rural area and I will be probably 15 miles out in the country, down dirt roads and it’s so much easier for me to stick the postage on the package and have the mail carrier pick it up at my mail box. I’ve never limited the U. S. only due to the cost of shipping but have done it because of logistics in getting the package mailed. And, for the record, as a blogger, I’m not real fond of doing giveaways. I agree with a lot of what’s written above about commercial giveaways. I never enter a giveaway that requires you to be a follower, unless I already am a follower, and all that “like me on Facebook” rubbish?! Forget that. I would like to point out that you only ever see these giveaways as US only, you never see UK only or Spain only etc… I highly doubt it costs more to post from the UK to another country than it does from any other country to the US if you see what I mean? I participate in the SMS giveaway, and yes, it is to get my blog out there a bit more, but also so I get to meet new people and find new blogs. I posted internationally and it wasn’t a problem. On the SMS giveaway day page, they divide the sections into “will post internationally” “will only post in the US” – again, it’s only US citizens that refuse to post internationally. I was going to make a comment but decided against it. I get so riled on this topic that I could go on and on. It just isn’t blogging that does that to the rest of the world. Its a lot of things. If I find it says for US residents only, I’m out of there so fast your head would spin. Then I never go back! There may be reasons, there may be circumstances but when people aren’t told about them, I’m left to feel like I’m not important to them. I never started give-aways on my blog and certainly never will. I want people to just come and read and enjoy. I love to be able to help my ‘quilting friends’ anywhere in the world! I have on several occasions purchased and sent items to other countries for just the cost of items and shipping that if purchased through the company it would be an outrageous cost. I too, don’t like the ‘join here or there’ and especially facebook/twitter when it comes to ‘give aways’. And I only join a ‘give away’ if I am really going to use what ever. When I had a give away I requested a comment about my blog only. I really wanted to know what people wanted to read and if there were any problems people encountered. I have attempted to read some blogs that the color of the background and the letters just blend together and are un-readable….. I am sorry that my fellow country quilters won’t reach out across the globe to other quilters and extend a helping hand. I will continue to share my love of quilting in any way I can. Angie, thanks for sharing your opinion about this and it is really interesting to read the comments. When I started blogging, I thought ‘giveaways’ was a must to arrange. I have participated in a few giveaways, but the more I read how and what you have to do – be a follower, FB and all that – it puts me off. Just recently, I think it was this week, I wanted to participate in a giveaway, but after a couple of ‘clicks’ it was thrown in my face; ‘US and Canada only’! Why on earth couldn’t that have been stated on the first page?! Just to fool people?! I have also thought of a giveaway, but after reading this post and comments, I have decided against it!